Bridge to Baia Destroyed by Storm! Jesus' eloquent description of impossibility, "It is easier for a camel to go through the eye of a needle than for a rich man to enter the Kingdom of God", was not much quoted on Capri in the 1st century A.D.; therefore, Thrasyllus, soothsayer by Imperial appointment, chose his own words when trying to convince emperor Tiberius that Gaius Caligula would never succeed him as Emperor. For inspiration, Thrasyllus looked across from the Isle of Capri, where Tiberius had taken up permanent residence, and suggested that the succession was about as possible as Caligula riding directly across the bay from Baia to Pozzuoli. That a bridge be built between the two points was unlikely because Tiberius as Emperor could veto any such plans. He was therefore able to settle down to his debaucheries on the Isle of Capri and nominate Caligula as his successor, safe in the knowledge that Caligula would not remove him prematurely from office—for Thrasyllus was rarely mistaken. He had, though, by long experience learned to tell his powerful patrons what they most wanted to hear. Gaius Caligula (image, right), in fact, donned the Emperor's purple soon after in A.D. 37, (after convincing Tiberius to sleep with his head underneath the pillow) and two years later the twenty-seven-year-old autocrat ordered that all merchant vessels over a certain tonnage be escorted to the Bay of Naples and anchored and lashed together with planks laid across them to form a continuous bridge from Pozzuoli to Baia. Some descriptions say that the bridge carried shops and gardens and that extra boats were used to form islands at intervals along the bridge. He mounted on Incitatus and began trotting across the bridge from the Bauli end. The whole of the Guards cavalry was at his back, and behind that a great force of cavalry brought from France, followed by 20,000 infantry. When he reached the last island, close to Puteoli, he made his trumpeters blow the charge and dashed into the city as fiercely as if he were pursuing a beaten enemy! We are also told that his return across the bridge was in the form of a triumphal procession and included spoils "captured" from merchants in Pozzuoli, and was followed by a night of festivities and celebrations which included naval attacks on the bridge and those unfortunate carousers who happened to be there. The cost to the Empire of withdrawing from service the enormous number of boats needed for the project must have been exceedingly heavy, especially for a Rome that was heavily dependent on grain imports from Egypt. Caligula, despotic and convinced of his divinity, appears to have been unconcerned at this and even ordered that the pontoon remain in place —he was deeply offended when Neptune saw fit to launch a storm which destroyed many ships and grounded the rest. 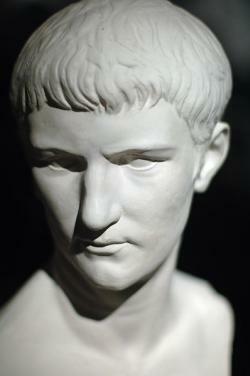 Caligula's brief reign ended two years later with his assassination in A.D. 41, and historians and writers have since painted him as a deranged megalomaniac. Certainly, his reign was troubled and disruptive and trouble broke out as a result of his treatment of the Jews, but, nevertheless, it would have been interesting to have sat on a hill above Pozzuoli all those centuries ago and watch the spectacle of this "living God" wearing Alexander's breastplate and flourishing Julius Caesar's sword, blowing an elaborate raspberry at the Fates.